Unlike the majority of paths in Lassen Volcanic National Park, there are no volcanic features or dramatic summits along the 11 mile Cluster Lakes Loop; instead the trail crosses wooded plateaus and basins, with only limited elevation change, visiting 13 lakes and ponds. Although all are generally similar in appearance, they do vary in such aspects as depth, shoreline, water color and surroundings, and as they are for the most part quite evenly separated, the hike, although rather long, retains its interest the whole way. Few people walk the full distance however, instead the only part which sees much traffic is the first 1.9 miles to Echo Lake, and a half mile section along the far side of the loop which coincides with the Pacific Crest Trail. Some parts traverse treeless, bushy flats but the majority of the land is thickly wooded, though about one third of the forested area has been burnt in a recent wildfire. Flowers are abundant in some places, especially around the lakes, along little drainage channels and in some of the burnt patches, though other parts are dry and have limited vegetation; most of the lakes are fed only by melting snow and in summer at least there are in general no flowing streams hereabouts. The best direction for the loop is probably clockwise, as arguably the least interesting section, 3.5 miles passing only one small lake, is done at the start, after which the remainder of the lakes follow in regular succession. Lassen Volcanic National Park overview map; Cluster Lakes topo map. 17 views along the Cluster Lakes Trail; gallery, slideshow. The Cluster Lakes Loop is right in the middle of the national park, half way between the two main volcanic areas centered on Lassen Peak and the Fantastic Lava Beds. The start is along the midpoint of the scenic drive at Summit Lake, the closest parking area being the day use lot on the north side of the lake, though the signed trailhead is a third of a mile north at the ranger station. 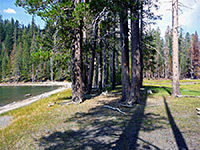 The vicinity of the lake is usually busy, with day visitors and people staying at the two adjacent campgrounds, but solitude quickly descends once the hike begins. 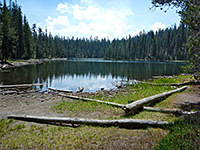 The hike starts by following the shoreline of the lake eastwards a short distance to a junction, where the Cluster Lakes route forks off, the main destination being Echo Lake, 1.9 miles. The surroundings are sparsely wooded, the trees large and quite well separated, and the land slopes upwards, gently at first, then steepening gradually. The trail reaches a flatter area affording the first views back west, towards Lassen Peak, before rising again up mostly treeless, manzanita-covered slopes to a larger and slightly more wooded plateau, where the path forks again at the start of the loop section. Echo Lake is now 0.9 miles ahead, while the other branch is a narrower, less used path heading north. The northern branch of the path climbs another 160 feet to a high point of 7,300 feet, after entering somewhat denser forest, then descends a little to the first, unnamed lake - small, oval in shape, and lined by big fallen logs down one side. The lake is entirely surrounded by flat, wooded land, unlike most on the loop which are partly enclosed by slopes or exposed rocks, though the conical peak of Hat Mountain can be seen above the trees to the west. The path remains fairly level for the next half mile, as it enters the burnt area, caused by the Reading Fire of August 2012. A tiny pond marks the edge of the summit plateau; beyond is a fairly steep descent to Little Bear Lake, which is shallow, and often partly dries up in summer, exposing many muddy boulders, between which grow numerous primrose monkey flowers. 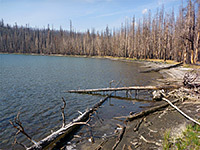 Soon after, slightly lower in elevation, is Big Bear Lake, only slightly larger, and bordered by a mix of grassy patches and fallen trunks, radiating along the shore. 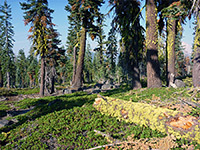 The trail continues descending gently, across land bearing a good selection of wildflowers, to the next junction, where another one of the Cluster Lakes can be seen a short distance north, reached by a path that leads 2.2 miles to a junction with the Pacific Crest Trail at Badger Flat, while the main loop soon reaches Silver Lake, one of the largest in the area. Low hills rise up on the far side, as the path follows all along the north shore, and through a thin belt of trees to pretty Feather Lake, ringed by a regular array of straight, burnt trees, their bark exhibiting a range of dark, mottled colors, merging with the greys of the underlying rocks. 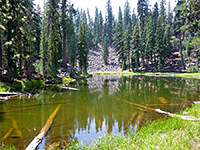 A little pond is adjacent, close to the edge of an unburnt section of the forest; the trail enters thick, green woods, climbing slightly, crossing a usually dry drainage and following the far side to a junction with the Pacific Crest Trail, a much wider route, flat and straight for half a mile south to the next intersection, signed 4.3 miles (west) to Summit Lake. A small cabin sits in the woods to one side. The next section of the loop traverses a narrow strip of trees separating Lower Twin Lake from an open, marshy area to the north, then curves south, running along about half of the shoreline, and up beside a little stream connecting to Upper Twin Lake, which is also passed along its west edge. On the far side of this lake, a moderately steep climb takes the path into a shady valley, close to a pond, as the terrain becomes flatter and somewhat sandy. Easy walking leads up the ravine, around another pond bordered on the far side by big broken boulders, then over a saddle to the last lake, Echo, which looks to be the deepest, filled with dark, greenish blue water. There will likely be other people hereabouts, as Echo is the closest lake to the trailhead. The hike is completed by walking west a little more across flat ground then climbing 200 feet to an open plateau, and on to the junction at the start of the loop section, from where Summit Lake is one mile away.